It’s me, Christine, the voice you hear on the recorded voice mail message, the name you see on email correspondences, the one you speak to about any and all questions here at Celestial Earth Minerals (CEM) and Mineral of the Month Club (MOTMC). Well, Lora and I literally shopped until we dropped this past weekend at the West Springfield Massachusetts Show. 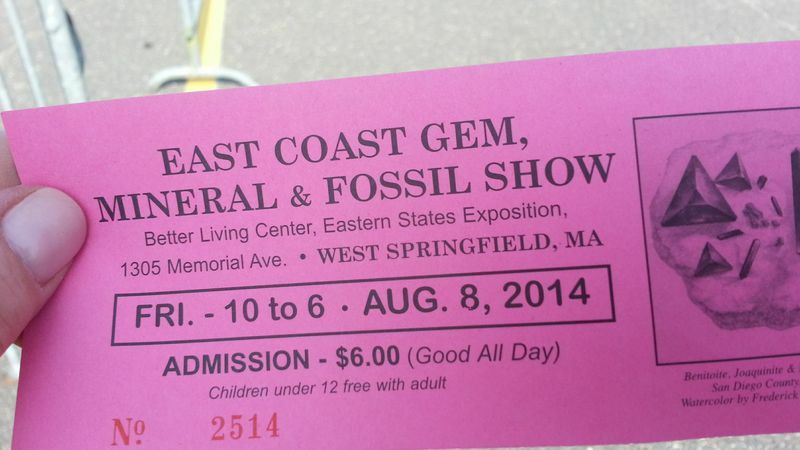 As you can see from the front of the trade show booklet, it is also called the East Coast Gem, Mineral and Fossil Show. It is the largest Gem and Mineral Show on the East Coast with over 200 vendors and an huge wholesale section. When the doors first open, there is an expanse of vendor tables…..
One find that I am particularly fond of is the Red Quartz from Morocco. 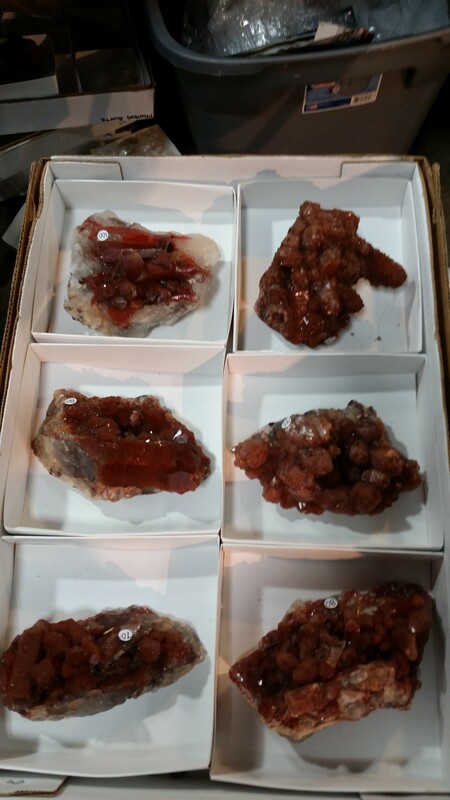 Some of the specimens crystal structure reminds me of Cactus Quartz, really lovely and a deep rich red color. I must confess that though we purchased over 25 minerals for the offering, I have been remiss in the photo taking. So hopefully soon , I will take some more photos for you to drool over. This is one of over 10 tables set up in the wholesale section by Howard Schlansker. Note the nice deep stacks of flats of minerals. Woo hoo, I was in crystal heaven! 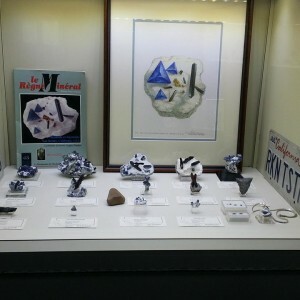 Every year Martin Zinn who puts on the show has a new special exhibit for mineral collectors to have the opportunity to see minerals they may not have been able to see. Here are a few photos of this years exhibit, which was from martin Zinn’s personal collection. I will create a photo album of the show on our Celestial Earth Minerals Facebook page. 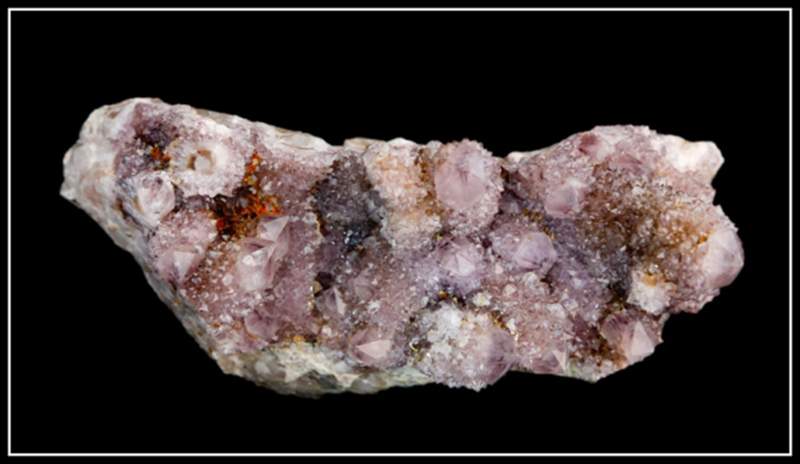 Distinctive deep purple, (amethystine) with “cactus” structured crystals. Only recently discovered in South Africa around 2001. Cactus Quartz has quickly become a favorite among rock hounds. 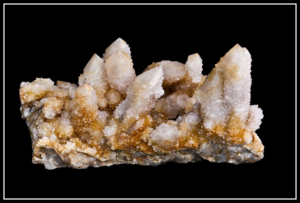 Its crystal structure is unique and distinctive from the rest of the quartz family forming a candle shaped crystal that has a faceted termination point that looks like the tip of a cactus and is surrounded by groups of smaller druse around the base or covering the entire candle shaped crystal. It is found only in the Magaliesberg Mountain region of South Africa. Some people also refer to it as Porcupine Quartz. though I am most fond of Spirit Quartz. pale lilac candle shaped crystal. Hematite inclusions are responsible for the orange color. Just like the rest of the quartz family, cactus quartz is comprised of silicon dioxide, has a trigonal crystal system and has a Mohs hardness of 7.0. The color ranges from pale lilac to a deep purple known as amethystine. After feldspar, quartz is the second most abundant mineral in the Earth’s continental crust. The most common constituent of sand in inland continental settings and non-tropical coastal settings is silica, usually in the form of….quartz! Over 70% of the land we walk on is comprised of quartz or other silicates in one form or another. The other major varieties of Quartz are Adventurine, Agate, Amethyst, Carnelian, Chalcedony, Citrine, Dumortierite Quartz, Jasper, Milky Quartz, Onyx, Rock Crystal=clear quartz, Prasiolite= green quartz, Rutilated Quartz, Smokey Quartz and Tiger’s Eye. Pale lilac cactus quartz with some tinges of orange and red that is caused by hematite inclusions. Multifaceted spirit quartz is like a community within one stone, helps to heal group issues, family concerns, easing communication and conflict. Because of its unique structure it is multidirectional and multifaceted allowing the energy to radiate out in all directions and for this reason is perfect for meditation or family rooms….hmm maybe even a conference room. 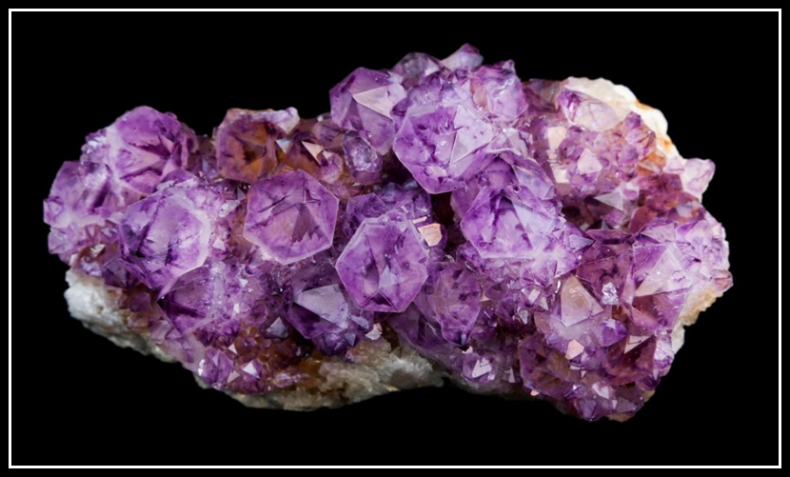 Amethyst is the traditional birthstone for Pisces and is the Fire element. It activates all of the chakras, bringing them into balance creates a feeling of stability and peace.In crystal healing layouts it can be used over the top of the head at the crown chakra or between the feet to align and balance the energy field. Use in home to promote peace and harmony. It is very cleansing to the aura and is believed to repel negative energies. It is a compassionate stone facilitating personal transformation on all levels. This is the perfect go to stone for mediation. Spirit Quartz meditation:Here is a little exercise you can try, place a piece of cactus quartz at the crown chakra and one at the earth star chakra and hold a piece of clear quartz in each hand and relax for 10 to 15 minutes, you can even set a timer if you feel that you need to. When you get up, write down any emotions, physical sensations or thoughts that came up for you. My experience with this particular meditation was a sense of profound peace. When I got up I felt refreshed and recharged. Feel free to contact me and let me know what your experience was at christine@celestialearthminerals.com, or on our Facebook page, Celestial Earth Minerals. When it comes to finding a wide array of quality rocks and minerals for sale, such as the ones we offer on our Celestial Earth Minerals website, it is not something you can leave to chance. It is important that you take the time to find a quality supplier, such as us, who will be able to not only provide the quality stones, but also assist with the purchase when necessary. Some tips to help you find quality rocks and minerals for sale on Celestial Earth Minerals are highlighted here. Our business has been around since the 1970s, closed for a short period of time and then reopened in 1996. We have expanded to offer an online website and now provide the largest selection of crystals along with resources such as articles and informative information about the products we sell. Among your friends who also purchase rocks and minerals that are for sale, is there a supplier that is especially popular? This is likely for a reason. When it comes to quality products, it is always a good idea to check with those you know to ensure that you find a supplier that truly offers quality rocks and minerals for sale. Chances are, you will learn that our crystals are considered top notch when discussing quality. While you cannot base your decision to make a purchase based solely on someone else’s opinion, it is a great place to begin. Once you have the names of a few suppliers of rocks and minerals, you should conduct some research of your own. Look at the supplier’s website. For example, when you visit our site, Celestial Earth Minerals, you will see an easy-to-understand layout, as well as information about the various rocks and minerals for sale. For those who are new to making these purchases, it is essential to learn as much as possible prior to making a move. If you are still unsure about the supplier you should use, then you need to contact our customer service department for assistance. This will provide you additional information regarding whether or not the supplier will be around to provide assistance regarding the purchase or the products you are considering. Be sure that contact information is easy to find, much like you will see on our Celestial Earth Minerals website. One of the very best, and fool proof, ways for you to ensure that you will be getting quality rocks and minerals for sale is to actually make a purchase from Celestial Earth Minerals. When you receive the product you will be able to make the judgment regarding whether or not you have received a quality product. Do not make a purchase from a discount or lower priced supplier of rocks and minerals, as the old saying ‘you get what you pay for’ is definitely true. When you take the time to find a quality supplier of rocks and minerals, such as our website, Celestial Earth Minerals, you will be able to have confidence that you are going to receive a high quality product. Using crystals for healing is an ancient modality that has been used for thousands of years. Chakras are the energy centers or vortices of life force energy that correlate to specific organs and emotions in a person’s body. Using the crystals from our website, Celestial Earth Minerals, for healing purposes, is one way in which you can incorporate different healing modalities into your life. Crystal healing has become an extremely popular practice at New Age and Metaphysical clinics and health spas. These techniques are often incorporated into Reiki and massage therapy sessions. Using our crystals in with these healing modalities can help to induce relaxation among other benefits. Crystals from our website, Celestial Earth Minerals, have healing properties that are based on the properties of their chemical makeup, vibrational frequency, and color. If you visit a crystal healer for assistance, they will likely place a number of our crystals and stones on your body to align with the chakra points. The most common areas that these crystals are placed is on the chest, abdomen, throat, forehead, hips and just above the head. The stones that are used and the way they are positioned are also typically selected based on the symptoms being experienced by the client. The placement of the crystals is influenced by the knowledge of chakra system, energy imbalances and information given by the client to the practitioner. It is meant to compliment modern western medicine not to replace it. The majority of crystal healers will become healers by passing a certain certification course. Many of these courses are offered online; however, others can be taken in clinics and universities. This is a practice that a number of massage therapists have also begun to offer as a complimenting type of alternative medicine to massage therapy. One on line course that is accredited is The Hibiscus Moon Crystal Academy. Using our Crystals For Healing enhances your life. Remember, that the quality of the crystals is extremely important, and we offer a number of high quality options from our website, Celestial Earth Minerals. While we are still growing, we provide crystals and minerals that are of exceptional quality for both healing practitioners and collectors. 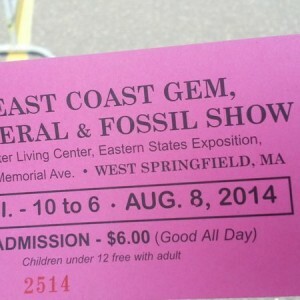 We attended the East Coast Gem, Mineral & Fossil Show in West Springfield Massachusetts this weekend and shopped until we dropped! Each year in August, Martin Zinn puts together the show with 200 or more dealers from all over the United States and abroad that focus on offering a vast selection of items related to the earth sciences. 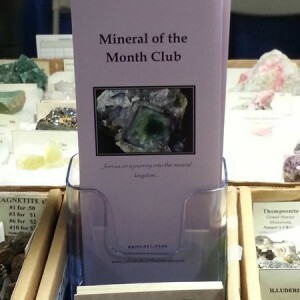 Christine met with a slew of vendors and made several very unique purchases for the Mineral of the Month Club members. 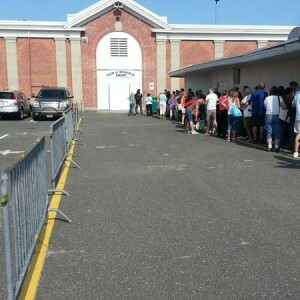 Got the ticket to get in…..
9:30 eagerly awaiting to get into the show. The doors open at 10:00. 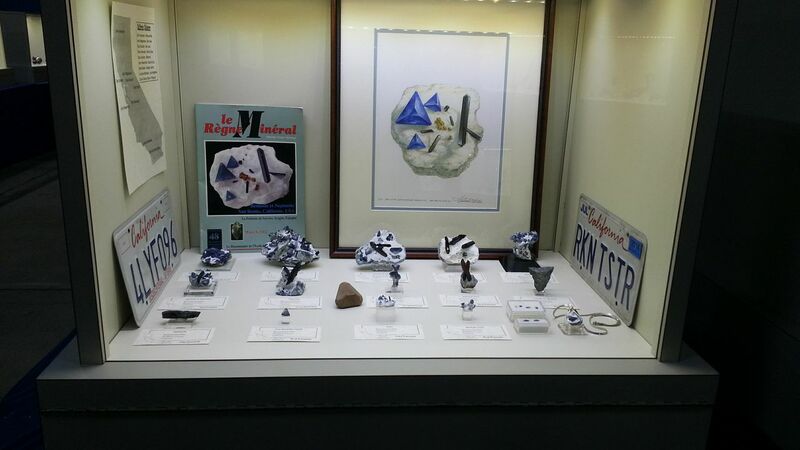 Benitoite and Neptunite from John Veetaert at Trinity Minerals for one of the Mineral of the Month Club offerings. Woo hoo! 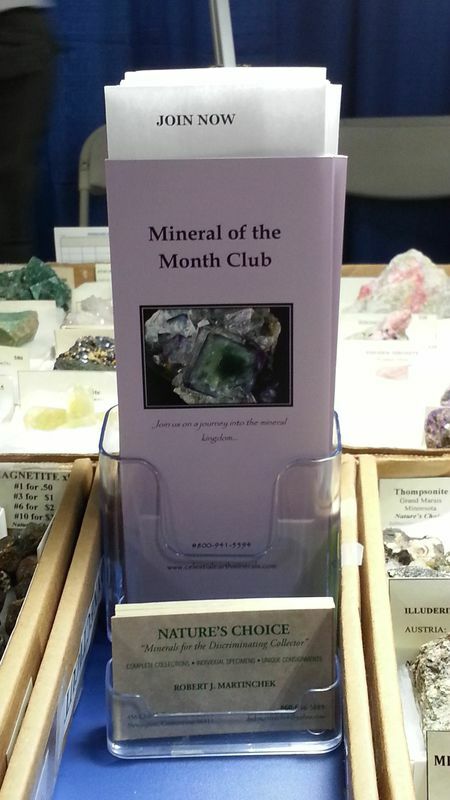 Bob Martinchek from Nature’s Choice had minerals from Mineral of the Month Club for sale at his booth. And very generously displayed our brochures along with forms to join while at the show. There will be more photos to follow of the California Collectors and Collections Display later this week.